I’m just kidding. 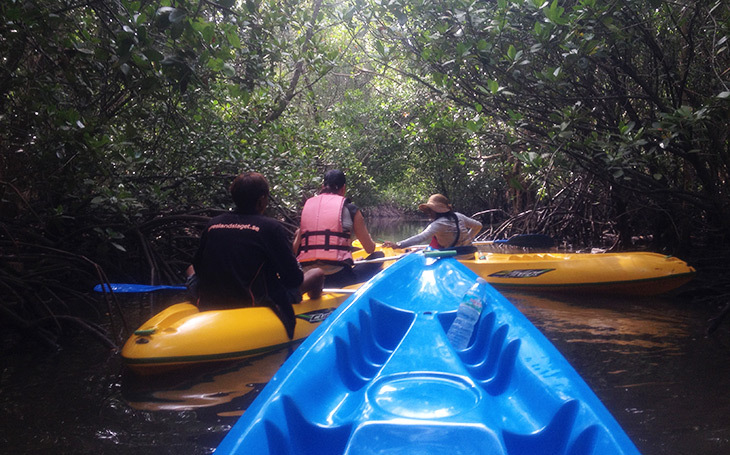 The kayak tour of Khanom’s mangrove swamps was a thoroughly unique experience. I’d recommend it to anyone who would describe themselves as agile. If, on the other hand, you fit into the doddering old fart (or fartess) category, you might want to think twice. But I’ll come back to that. If you’re a regular reader you may already know I’m not a great fan of water, nor am I much of a morning person. If you know me well, you may be saying “You’re not much of an evening person either.” Hmm, okay. Probably true. A challenging start to the day. Walk this way. But first an aside. I’ve been trying analyze why I’m not crazy about being in water. Most people think it’s great fun, and the instant they see a pool or the sea, they just have to be in it. You’re probably one of those annoying people. I think it all stems back to my upbringing. My father was an accomplished swimmer and water polo player. He seemed to think I’d be the same. But he was a chunky fella, and I was a skinny five year-old spring peeper. Nonetheless, every Sunday morning, usually in the winter when there was nothing better to do (like sleeping!) we’d have to go to the public swimming baths. The outside temperature would be five degrees, the unheated water would be much the same. Any time we went to the sea in the summer, we’d have to go swimming. Air temperature would be ten degrees, and the water temperature somewhere close to a recently-thawed Arctic iceberg. Needless to say, I had to be forced to do these things. Temper tantrums had no effect on my father, other than to elicit a swift slap round the ear. It was ever thus in those days. Why? Why? Why? was all I could wonder. Where is the pleasure in this? Just yesterday I was walking on the beach, and there was a guy way out to sea … the sand slopes very gently … and he was just standing there. A half hour later as I returned, he was still there, just gently bouncing up and down with the waves. I felt like wading out and asking why. But that would have meant getting wet. I just don’t get it. Maybe his name was Bob, so he felt he should. 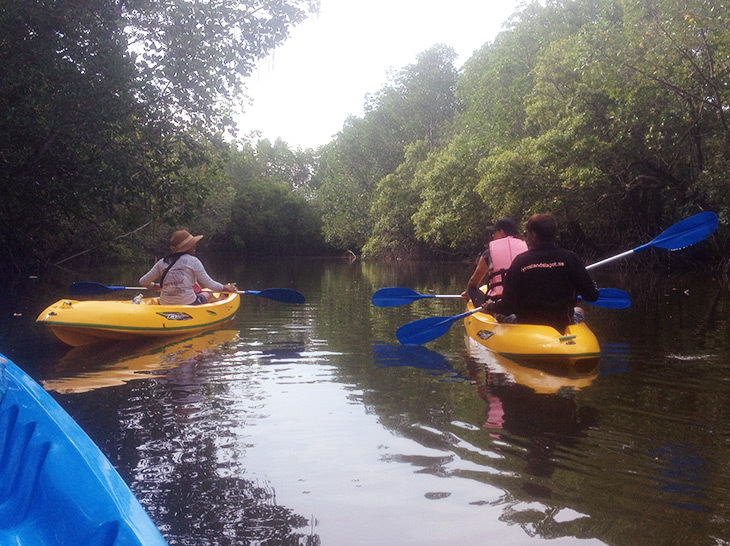 Anyhoo, right in the middle of Khanom, very close to the who-the-hell-has-the-right-of-way crossroads, there’s a large banner on the sidewalk advertising Mangrove Kayaking. It seemed to be outside a place that is always closed. Then one day I noticed the small print. It’s only open 1300h to 1900h, or something like that, and I was usually going past after a morning shopping trip to somewhere other than Khanom. Makes sense. Mornings, they’re busy floating around on their skinny plastic thingies. 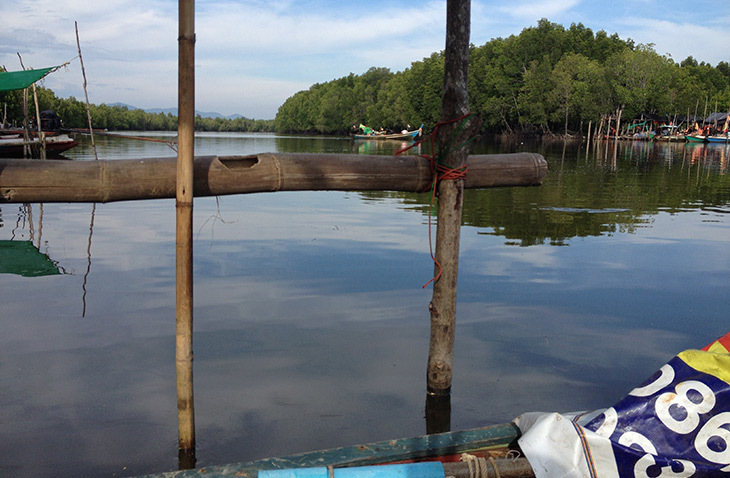 I’d tried going into some of the neighboring establishments, only to be met with blank stares, so on the one day when I thought I’d found the right place and there were actually people inside, I bounded in – perhaps over-enthusiatically – and breathlessly asked “Are you the Mangrove People?” Yes, they were. 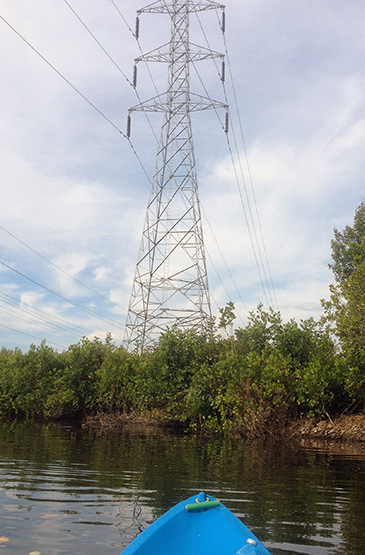 Amazing what you can grow in a mangrove swamp. Well, the deal is – you pay them a small amount of money, and they tell you where and when to meet up. Seemed simple enough. The place is run by a young Swedish guy and his Thai girlfriend. We did the introductions, and I quickly decided the guy’s name was completely unpronounceable, and resolved to call him Fred. I figured his girlfriend would have some similarly complicated name (she doesn’t, it’s Phrea, or at least sounds like that) so I nicknamed her Freda. “Fred and Freda the Mangrove People.” It has a certain ring to it don’t you think? Fred and Freda explained to me that I needed to be part of a group, but that I could join one at any time, and they’d call and let me know. Fred’s in Sweden, so Freda called me two nights ago, and said “Wednesday.” Damn. I thought they’d forgotten. Which is why I was staring at a kayak at 8am today. The “tour group” consisted of Paula from Finland. So there we were, Phrea, Paula, and Paul – three Ps and three pods. Seemed appropriate. 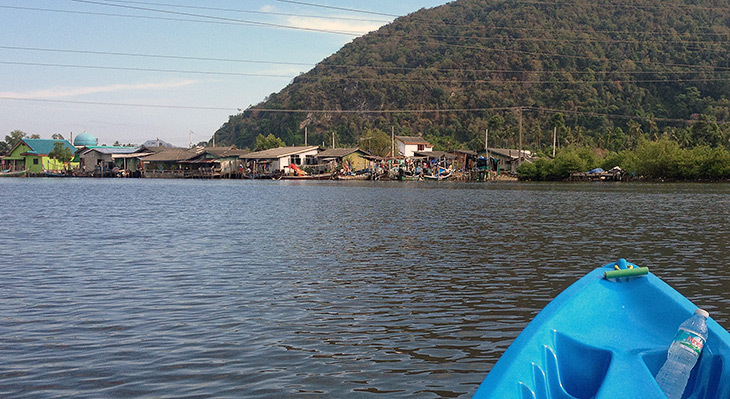 Now, if you’ve ever tried kayaking you’re probably thinking, no big deal, sit on the thing and paddle. And I mean “on”. There’s a tiny dent for your bum – actually two tiny dents for two bums – plus three sets of indentations where you can put the heels of your feet. I never did decide which set worked best. And with the water being quite low in this hot season, you have to figure how to lower yourself onto the thing while maintaining your balance. Okay. Survived that bit – with some help. So off we set, down the wide river, making various turns into ever-narrowing (and to a newbie, ever-harrowing) side channels. I must admit, it’s not hard. But I found it difficult to get comfortable. There’s no back support, so you end-up kind-of hunched forward, with your legs taking a lot of the strain. Once in the narrow channels we were floating along at probably 0.1 knots (best to be nautical about these things.) 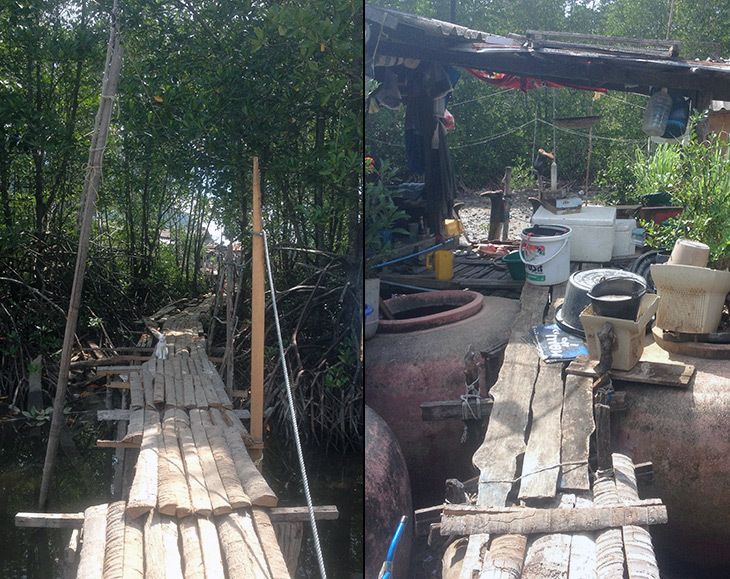 Successfully navigating the many mangrove roots and overhanging branches was very satisfying. Just a small dip in the water of one end of the oar will make a small but subtle change in direction. You just have to remember which end of the oar! Not long after we’d started, I realized my big mistake. Fred2 and Paula took off briskly, thanks to their two oars, Freda went next, with me bringing up the rear, and constantly playing catch-up. Anytime they stopped, I’d catch up, and off they’d scoot again. Also, Freda gave me lots of where-the-hell’s-the-handbrake moments, when I noticed her sideways ahead of me. Was I supposed to shout “Ahoy Amidships” or something similarly piratical. Maybe my imaginary parrot should have done that. She made we wonder if her Swedish boyfriend had been giving her lessons on how to drive sideways on snow, and she needed the practice. Although, in fairness, I did discover later that Fred1 usually does the “driving” while Freda gives the running commentary. And boy, is she ever good at that. Uh oh. Freda’s sideways again. Thanks to the frequent catch-up breaks, and the photo ops, the one hour trip became two. If it had been two hours and five minutes I would have died. Lots of normally unused muscles were used – and used – and used. So much so, that when we finally arrived back at the tiny strips of wood that serve as the jetty, I started to wonder, how the hell do I get up there? If I’d had two bowls of Wheaties plus one of porridge oats for breakfast, maybe I could have done it. But, sad to say, whatever strength I’d had in my legs at the start, had been well and truly used up. Eventually it was decided I could be hauled-up backwards. Which is exactly what happened. It must have looked something like an elephant being lifted onto the back of a truck with a crane. Thankfully though, only two hours after reaching home, I seem to be back to normal, so no harm done. But to get home, I had to resort to lifting my left leg with my hand in order to operate the clutch pedal! And I thought I was reasonably fit. Upper body, maybe. Legs, seriously not. Work must be done. 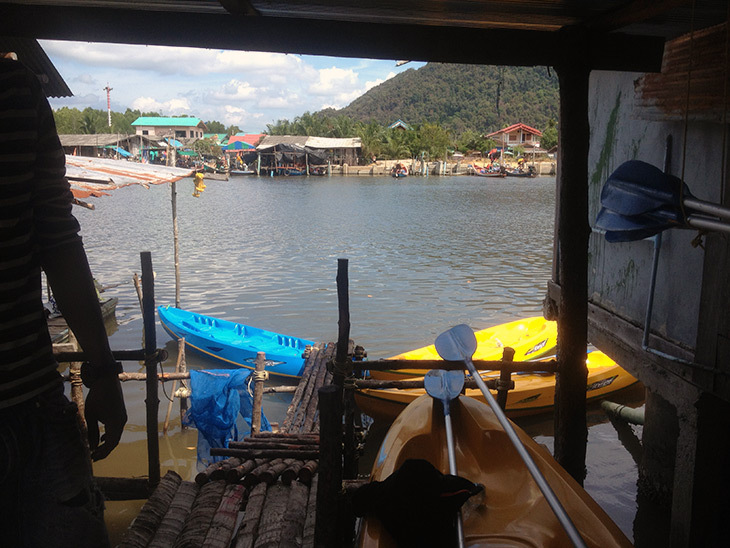 Not so that I can go kayaking again anytime soon, if ever. I think that was a once in a lifetime experience. But it really was a hell of an experience. No regrets at all. 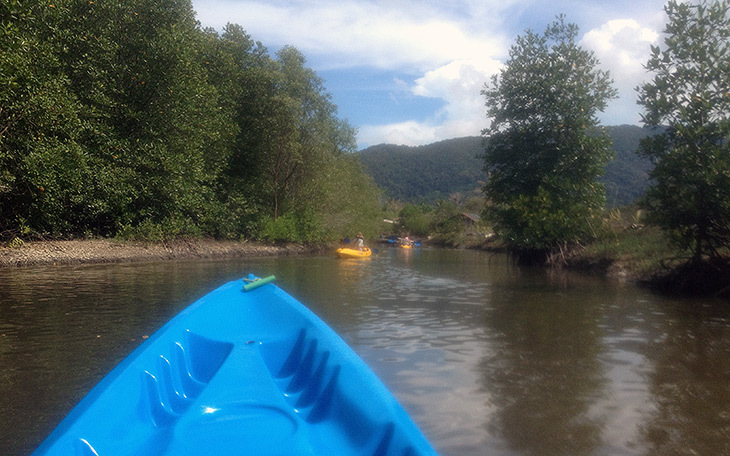 If you are in Khanom, and you are reasonably fit and agile, give it a try. I’m afraid the photos don’t really do it justice. Freda warned me “You’re going to get wet” so I decided not to take the DSLR, and only used the iPhone camera. A number of photos I’d like to have taken, I couldn’t. My hands were too wet to do the needed swiping and tapping, and I’m sure at some point there was water on the lens. I think Freda’s going to send me some, so hopefully I can add more later. And, no, you don’t fall in – at least I didn’t. 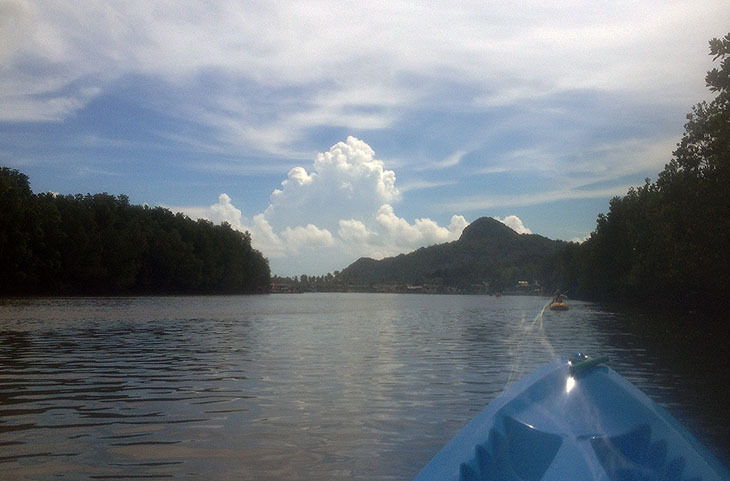 The water runs down the oar, and gets splashed back onto you, which in these hot times is quite pleasant. Swimming shorts and a t-shirt are the right kayaking wear. Just make sure you’ve had your Wheaties. 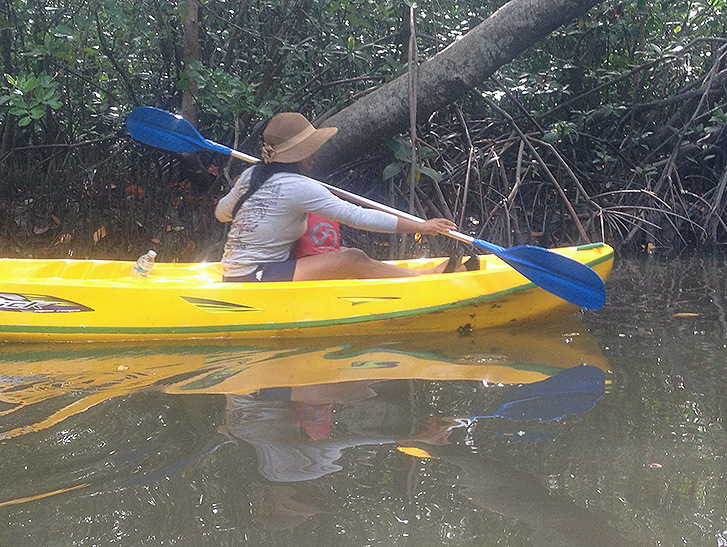 Oh, and you can find the Mangrove Kayaking People on Facebook.